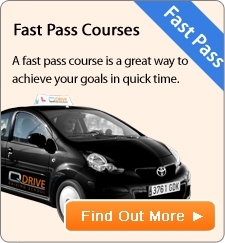 The Part 2 consists of an eyesight test and a test of your ability to drive to a very high standard to prove you have a thorough understanding of good safe driving techniques, and that you can also demonstrate them. The test lasts for about an hour. You must pass the eyesight test and driving ability test at the same attempt. If you do not pass the eyesight test, you will not be allowed to take the driving technique element. The test will be marked as a fail and will count towards your three attempts. This test is far more difficult than the learner test. It is of an advanced nature and a very high standard of competence is required. You must show that you have a thorough knowledge of the principles of good driving and road safety and that you can apply them in practice. At the start of the test you will be asked questions on basic vehicle safety, based on a Show me/Tell me format. The routes used for the test will cover varying road and traffic conditions and, where possible, include motorways or dual carriageways. The routes will cover both urban and rural conditions. Any faults are recorded on the examiner's test report form DL25. If your action or reaction to a situation is incorrect it will be assessed and marked accordingly. You are allowed a maximum of six driving faults throughout the test. Seven or more will result in a failure. One or more serious or dangerous faults will also result in a fail. At the end of the test, the examiner will offer a debrief on all driving faults (The DSA encourages candidates to have their trainer on test or to listen to the end of the test debrief.) A copy of the test report with explanatory notes will be given and a letter confirming the result will follow. You are allowed a maximum of three attempts for this part. If you fail all three then you have to wait for two years from the date you passed your Part 1 test. Then you have to start from Part 1 again.